The totality of the Sunset experience begins from your commute to the unique site, winding through Perth’s ostentatious Western suburbs, overlooking the glimmering Swan River. The luxurious mansions decorating the neighbourhood are juxtaposed by the abandoned Sunset Old Men’s Home, where this magically unsettling dance theatre piece lives. Upon arrival, a man in a tuxedo greets you with the sombre sound of a violin. You file into the main location of the century-old building, red dirt spilling out of the walls; dust diffusing into the air, leaving a mysterious haze. You proceed into an old dining hall lined by muted blue and yellow walls; a stage, a canteen and a pile of chairs outline the space. This is where majority of the performance unfolds. A pleasant nurse dressed in whites (Bernadette Lewis) offers the audience tea and biscuits upon arrival, I accept the offer. The slightly cold tea is unsettling, a perfect match to the ominous climate of the room. Lines are blurred between performer and audience from the start and viewers indulge in a 360-degree experience. The audience is entertained by an array of characters from different times and places. The STRUT dancers masterfully inhabit the distinctive personas, all united by the universal feeling of loss. A dance begins upon the old-school stage, of a young girl prancing and twirling as if stuck in a dream. Nimble dancer Viola Iida embodies the spirit of a lost daughter, who is summoned by a veiled, mysterious woman, her malevolent presence central to the disturbing nature of the piece. Now, an imagined resident of the Sunset sanctuary, named Alfred Ganz and played by Humphrey Bower, recites a poem. His memories are the soundscape for a weeping mother in black (Natalie Allen). As she stumbles at the loss of her child, her sense of grief is vivid and poignant. Her affliction follows her into a solo where she flails and flies across a wall lined in windows. Luminescent vignettes of the remaining characters glide behind the glass, like moving Renaissance paintings. The windows are now a portal between the living and the dead, as figures fly in and out of the frames to try and save Allen from her harrowing flounder. It’s beautifully evocative image. The ghostly figures infiltrate the space as the energy of the piece crescendos; a miniature live orchestra is revealed and provides a stirring soundscape. Dancers circulate the room, relentlessly falling, throwing their bodies towards each other. A procession of dancers emerges calmly amongst the virtuosic movement. One by one, each dancer stares deep into the eyes of each audience member, sharing their grief through the intimate gaze. Guided by the haunting voice of lead vocalist (and composer/sound designer) Rachael Dease, the piece ends outside, amongst a garden of lights. The audience finishes gazing up at the performers, who stand on a hill, staring longingly at the river. I was so transfixed by my surroundings that I couldn’t believe the show was over. The perfect marriage of dance, design and music transported me to another time and place, a place that smelt of tears, sounded of breaking hearts and was filled with spirits united by love and loss. * Giorgia Schijf is a 2018 WAAPA Dance graduate and the winner of the WAAPA Dance Prize for the most outstanding written review of a dance performance, 2018. 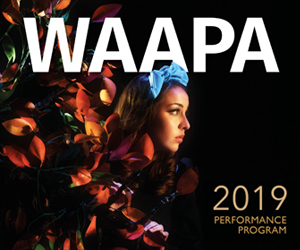 This is a special award for the WAAPA dance student who made the most outstanding contribution to the field of dance criticism throughout their studies at WAAPA. 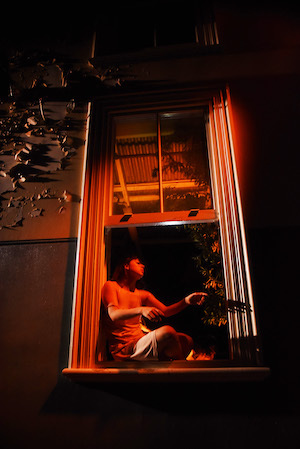 The award, made possible by Seesaw Magazine and Perth Festival, allows the award winner to review a 2019 Perth Festival dance work, and have that review published in Seesaw Magazine. Seesaw is delighted to publish Giorgia’s work. You can also read Seesaw editor Nina Levy’s review of ‘Sunset’ here. Pictured top: Sarah Maelor. Photo: Simon Pynt.